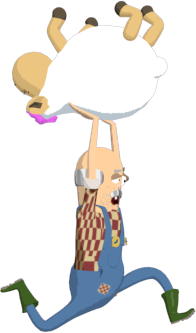 Idiot Squad is a puzzle game in which you head a commando of sheep. Farmer Ben is angry! His ewes were finally ready for the village's annual competition, but the Chuck brothers stole them last night to make sure he has no chance of winning. Ben is determined to get them back. He has formed a special commando to enter enemy territory and exfiltrate the kidnapped ewes. He has trained his best sheep to be simply the best: The American football player destroys all obstacles, the ninja jumps over obstacles, the gunner is equipped with a cannon. But sheep, even if perfectly trained, will always be sheep: too stupid for words. They need someone with a brain to command them. Why not you? 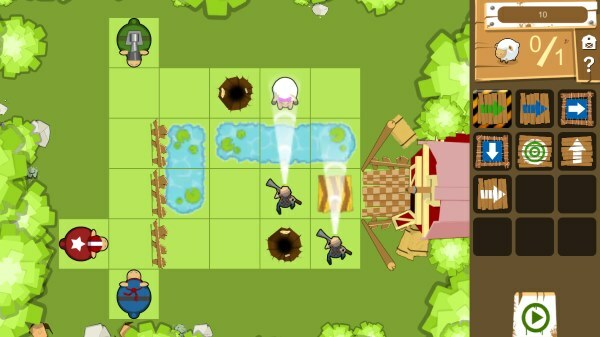 Idiot Squad is a puzzle game in which you head a commando of sheep. Make sure to prepare your missions well to recover the kidnapped sheep throughout 50 levels. Farmer Ben is counting on you!